No, it’s not because I am turning into Kermit. The waves of life have me feeling a bit green around the gills…so to speak. Yup, it has been a really rough couple of months. The sluggish and stuck parts keep lasting longer than I anticipate. Keeping up with this blog requires creative motivation and a bit of muse help. As many, if not most of you might know, that can be tough at times, to come by. Anyone see my muse lately? Also, not having any interaction yet, has gotten me a bit down. I apologize for not doing all I had set out to do…well yet, but it is hard to do when you are not sure what you are doing is actually making any difference, or noticed. Lately when I call upon that spark, it has just been dwindling out or away from me. But, I will ride it out, and I will continue on, determined. Even if I stall, I just refuse to give up. So, I heard from someone special to me, just recently. It had me elated. But when the burst of excitement over this calmed down, I was left with a flood of emotions and unsure what to do with it. So many feelings were brought up that I hardly knew how to handle it all. Ever lose someone incredibly important to you in your life, become devastated, and then come to find one day they come back? It is a good thing, but even good things can be hard or draining. After that burst, I found that the flood of emotions had drained me of energy, and I know it just takes time to sort it all out. Yet, another wave. It took me several days to respond to them, but I finally did today, and I am actually feeling proud that I faced something that I knew would be incredibly hard for me. I might move slow, but I do eventually get to it. I am not ready to share much here yet. It is incredibly personal, emotional, and important to my life, and someone else’s. Also, it is hard to share things like this when you wonder if anyone is even really listening, paying attention, or you don’t have that interaction. But, I shall prod on, because something, somehow, somewhere, some way, just keeps telling me to go with it, to put one foot in front of the other, and go with this. Meantime, I hope anyone still out there has not given up on me. I really do have so much to share, and think I have my own unique share of talents. I want to give of those. I even truly hope to benefit others, as much as possible. They are the paving stones toward the good things that are to come. We all go through many trying and difficult, and downright agonizing moments in life. Sometimes you feel like you cannot go on another moment, sometimes you are just moving slow and are very tired. It can truly lighten the load, if you remember, sometimes these things are moving you toward something better. After all, how can we grow, if we don’t suffer those growing pains? The most beautiful metals are molded through extremely high heat and change. Remember that the next time you find yourself struggling, and strive to anticipate better things on the other side. It can make things feel a lot easier to handle. It won’t remove the pains and sufferings, but it can make you hang on tighter, get through it, and look for the things you can learn from it. This is what I am learning to do…still. There are a lot of dark moments behind me, and sometimes they pop back up and rear their ugly heads. I am learning, even if ever so slowly, that something good did come out of them, even the good I cannot see yet. I just need to have faith in that. If I look back on many good things in my life, I know that many not so good things led up to it. I bet if most people examine their lives, they will find that to be true for them as well. So, on this note, I leave you with something I created today that has this quote, again which I wrote, to remind us all. The quote is set on an image I took this past weekend, at a nearby harbor. The sunset was beautiful. It served as a reminder to me, that good things have come from the bad, and I believe more are to come. I am going to print up a copy to put on my inspiration bulletin board, and even a copy for inside my planner, and for my desktop too. I don’t know about you, but I need all the positive reminders I can get, so I can keep my eye on the goals…”keep my eye on the ball.” Plus it helps me to regain some steam when I need it. I hope it can somehow help any of you, and remind you just when you need it. As always, I am putting a smaller copy here, but a larger copy is at this link for you to download for your personal use only. I hope that whatever you go through, you can find the positive in it, and get through okay on the other side. Happy Valentine’s Day all! I can’t go into too much detail now, as I have promised my wonderful other half, J, that I would go out and walk with him, we are going to dinner, and getting all romantic for the holiday. =) But suffice to say I have been contacted by someone very, very dear to my heart who I have not been able to speak to, for over 5 years now. This is a very special and precious person to me, and it might be the start of repairing this relationship. I will try to go into more detail as I have more time, and as I feel comfortable. But it has me elated, and feeling hopeful. Put it this way, it is THE most wonderful Valentine’s present I have EVER gotten. Now, down to blog business! I have created a new theme for the holiday, granted later than I wanted. It has been a rough month, but I have a feeling things are going to get so much better, especially from within. At least the theme is up for today, and will be until next month. I hope you like it! It stars my other precious fur-baby, Honey, as she peeks sweetly out from underneath blankets and towels. My beautiful Red Point Birman. Even if you don’t feel like doing this project for this Valentine’s, you can do it for next year, or you can slightly change the way it is embellished and fit it for ANY holiday or time of year, or even theme. The nice thing is, I did embellish it for Valentine’s Day, but it would look nice with any design you add to it, whether it be spring, Easter, summer…anything you like! So despite my lateness this last month or so, it will still be useful, and hope you like it anyway. Since I am needing to head out the door real soon here, I just thought I would get this new theme posted, tell you about the project, which I am intending to get done and posted tomorrow/Monday, and also I have partially finished some printables for Valentine’s, but even if you don’t need them for this year, they will still be nice for next year or however you wish to use them. Stay tuned the next day or two, and I will have a few things to share with you. I hope, whether you are romantically involved or not, that you have been/are/already did spend it with those you love and dear to your heart. That is the most important thing! I’ve been thinking lately about the contrasts between light and dark, in terms of positive and negative. It is interesting to me that often, as humans, we associate dark with negative, and light with positive. Philosophies are abundant with it. I do the same too. Dark can be good though, as in a beautiful, peaceful, dark, starry night. Light can be negative, as in a person not feeling happy, waking up, and the light makes all that is painful feel vivid and clear. Shedding light on negative things, can make them seem starkly apparent and overwhelming. But for the purposes of what I have been thinking about, and wishing to write about, I am sticking with the notion of dark representing negative, and light representing positive. It is most commonly how I feel about the concept, and how most seem to feel, that I can gather anyway. The past year or so, I have been concertedly striving to accentuate the positive, and veer away from the negative. I suffer from depression, have I mentioned that? Recovering from, healing, or even eliminating that can be a very long-term battle. I think I will always battle that in my life, but I do believe there will come a time when it will be almost easy, most of the time. The reason I feel this way, is because I am determined. I may or may not be a lot of things, but lacking strength and stamina is definitely something I am not. I have endured a lot, so much more than I care to even think about. Those things I have endured have taught me a lot. But most of all, they have taught me I am very strong. They have also taught me to appreciate the positive, and to strive to improve or ignore the negative. So lately I have pondered on what that means, how to do so, and what difference it can make. It has occurred to me, nothing ground-breaking, mind you, that positive can be a matter of shedding light on good, and dissipating the light on negative. Think of standing in a large empty room. Now place one table on one end of the room, and another table on the other end. On one table place an object, say a bright yellow flower, like a daffodil. Now place a decayed or dead flower on the other. Now take two very bright lights and place one above the live flower, and one above the dead one. Now imagine using dimmer switches on both lights. If you completely raise the light on the dead flower, and then lower the light on the live flower all the way, what you have left is only the light on the dead one. You look at it and it’s presences conveys sadness, decay, death, neglect, emptiness, and other negative things. You cannot see the live flower, so you do not feel the positive that can be associated with it. You merely see the dead flower, and can feel the things that go with it. Now turn down the dimmer all the way on the dead flower, and turn all the way up, the dimmer on the live flower. Now you see a live, vibrant, colorful, happy-looking flower. You no longer see the dead one, and as you stare at the live flower, it’s color and vibrancy can help you to feel what it also denotes. Can you close your eyes and see all this and feel what I mean? Mind you, nothing changed really. The dead flower is still there, and the live flower is still there. We only changed what we highlighted. But can you see what it changes in what we see, what we think, and how we feel? This is how I see positive and negative…and what I wish to change or improve in my own life. Life is chaotic and complicated at times, especially when it comes to humans. It will never go smooth or perfect. Circumstances around us will often be hard to deal with, or very complex. But they will often, if not always, be changing. We usually cannot do anything about that. I know in my heart of hearts, most times, we can only change how we see it, and how we deal with it. I might be driving along and come to a traffic jam. This might frustrate me or upset me. Maybe it will even make me late. I can either realize that I can do nothing to change it and just accept it, or I can frustrate myself by letting it get to me. We are all human, and the latter will happen to us all, no matter how hard we try. But, for me, I feel the good news is that we can retrain ourselves and learn, and overcome this most of the time. It is hard, but it can be done. For myself, I have a long ways to go, but I am happy to say, I am working hard at it. For several years, I have gone through what I have heard some call, my “dark of night.” It is a term used for a period of time you go through, in which you have extremely hard times, hunkering down, perhaps even very depressed, or sad, or energies suppressed, and you just basically cocoon yourself, hopefully to endure and heal. It is a very transformative period, and usually many people come out of it with a lot of enlightenment, a lot or some personal inner change, and a lot of their life changed. It can feel like a long time that will never end, feel very dark, and be very painful, hence the name. Mine lasted quite a number of years, and I am only slowly coming out of it now. It began with a lot of my mother’s illness, continued with a lot of personal loss, and then went into me losing everything, having to uproot, and move three thousand miles away and change my whole life. It was the hardest time of my life, and I am still reeling from some of it, but I am in a much better place now. Now, I am slowly coming into the light, but that darkness tries to follow and envelop me. It has tried to follow me again since my father passed away. I might falter or sometimes fall, but I refuse to let it take over. For me, there are only two things that can work to do that. One, having love in my life. I do not feel anyone can exist without it. I feel people need to share love with others in order to have peace and wholeness in life. Whether it be friends, family, adopted family, a partner, even pets helps that. For most I believe it takes a combination of a few or several people in those capacities. I have one great friend, my other half, my kitties, and some new family through my sweetheart that helps with that, in my life. The second thing that helps with this process, for me, is to shed light on the positive, and diminish the highlight on the negative. I cannot make every thing better in or around me just like that, but I can shed the light on the good things, and strive to look away from the negative, especially if I cannot readily change it. When bad things happen, I can complain and feel bad, which I still will time to time, but if I put most of my effort into being grateful for what I do have, and for the good that comes out of most things, then it changes my outlook. I find myself feeling better even about the little things. This does not always work mind you, and when I struggle with depression, and even anxiety, it makes it even harder. But most habits do take time to learn, and I believe I can learn them. Also, it is important for me to give myself slack. When I do get negative and feel bad or complain, I try to catch myself and counter that by finding something to feel grateful about. But it is important for me to not chastise myself for slipping, or even falling. Self-condemnation or guilt doesn’t do me or anyone else any good whatsoever. Instilling bad feelings in one’s self is counter productive to the point of it all. If I choose to get positive, then being negative with myself for not achieving this, just keeps me on the wrong path, and is counter-productive to my original intention. So, if I do slip, I tell myself it is okay that this happened, that in time I can un-learn these habits, and next time I will do better. In fact, I try to, so-to-speak, “pat myself on the back,” for catching it, and making an effort to remedy. I keep telling myself positive begets positive, and negative begets negative. If I feed the positive, I get more positive. If I feed the negative, I get more negative. I see it as only win-win, if I keep striving to feed the positive. I know it will make me healthier in body, mind, soul, and emotions. This can be a slow process, and I feel it takes small steps that I think lead up to bigger ones. Change takes time, and I think we as people need to give ourselves a break, but at the same time be determined and persistent. If I fall off, I know I need to try to quickly get back on. In this society, I know at times we can be hardest on ourselves and not give ourselves allowances. In our instant gratification, and impatient times, they seem to go hand in hand. But for me, and even for others, I feel while persistence is key, so is patience. Ever have a time where you were in a very dark room, concert, amusement ride, etc. and you quickly went out into the light and it seemed to hurt your eyes? Have other times where you were in bright light and suddenly went into a dark room or the like, and you felt like you could not see a thing? It is the drastic contrast that makes it so hard to adjust so quickly. I feel that changing one’s perspective is akin to that. It takes time. I do not think there is any way around that. You cannot come from a negative place and tell yourself that you will be positive and make it happen just like that. You have to shed light slowly, and adapt habits with time and patience. Then you give yourself room, feed the positive, like when you falter, tell yourself it is okay, and get back on track as you can, and then only give yourself positive when you do. Any negative can slide you backwards. And there is no avoiding that, it will happen. Again, I feel this is okay. I think to get into the light and really live it and feel it, it has to happen slowly, or like our eyes in contrasted light, we do not adjust well. Then there is a matter of needs versus wants. It can be hard to decipher between what we need and what we want. I feel that sometimes we need to get stuck in a difficult or painful situation because we have not learned from it, in total, what we need to. We might not want it, but whether we hate it or not, we might need it. Again, here is where it will take time to shed light on the positive slowly, and get into a better place. 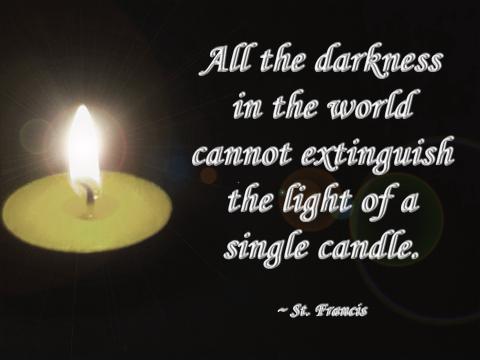 The darkness does have purpose though. My four or so months away from home, was a rough time for me (refer to past posts if you wish to know what I refer to), but somehow I held onto the positive more often than I would’ve thought. Ironically, after getting home, I hit a dark time. I think while I was busy getting something extremely hard done, I was ignoring that my father had died and how painful our relationship had been for me. Now that this rough patch is passed, I think it has had time to hit me, and real hard. I have been stagnant this past month, which also included me being pretty sick for a week or two. I set off at the start of the new year with a positive outlook and determination. But somewhere along the way I ran out of steam, got stuck and discouraged, and shut down a bit. That is why I have not posted to this blog in a couple weeks. It is sort of like a mini “dark of night.” I could chastise myself and feel guilty for not doing what I set out to do. I could also feel guilty that I did not post to my blog what I set out to do. I could even punish myself inwardly for this. I have typically done all this in the past. But what good would that do? What purpose would that serve? This is how I always did it before, and it got me no where. The quote goes, “the definition of insanity is doing the same thing over and over and expecting different results.” (Some say it was Einstein that said it, some say he never did. For this purpose, not the point either way. It’s meaning still remains the same.) Since that method never worked, it is time for me to change the cycle. Rather than mire myself in negative feelings about it, it is time to just pick myself up, dust myself off, feel okay with myself for realizing this and for getting up again, then move on, and move forward. So, I am here today sharing with you, my thoughts on positive and negative, dark versus light. This is how I get up again and keep moving. If I keep shuffling my feet, “they” can’t bury me…whomever they might be. 😉 I look out my window, and the weather here is odd this afternoon. The sun is very slowly starting to peer out, after a bunch of days and nights of gloomy, rainy weather. Yet while the sun is getting brighter and warmer, the rain is lightly flowing down in a sort of drizzle…maybe slightly harder. It mirrors my place right now. The sun is starting to peer out, as I come out of my short time of semi-darkness. My inner poet finds that metaphoric and succinct. But it confirms what I already know…that it will get better. It might be small steps, but I know it will get better, because I will not stop working in that direction. I am in a good place today, despite setbacks. I was scheduled to take a crochet class at a local craft store, but it got cancelled on account of no one else signed up. I am disappointed. I wanted this class to not only teach me to crochet, but to get out of the house, to meet people, and start myself getting busier outside the house. I really want to learn to crochet. I used to knit long ago, but I wound up drifting away. I think this is because it is a bit complicated, and I hear crocheting is a bit easier. I do not think they have another class until over a month away, which makes me sad. I am hoping perhaps I can find instruction elsewhere. While I know I can learn this on the net, or from youtube, I really wish to interact with others while learning. But we will see what happens. Despite this, onward I go. J’s mother is supposed to be coming over today so we can go through old pictures of their family together. I will enjoy that. I finally get to see pictures of him growing up, and I hope to help her preserve them for other family members, and the future. I am going to help her digitize them all. Did I ever tell you that I love to restore photos? At one time I thought I was pretty good at this. Would you like me to share some samples of this? Perhaps one day in the next week this will be one of my first editions to my “great experiment” section…some before and after restoration work. Also, I am thinking about sharing some pastel artworks I have done. I would love to hear what you think. Are you in a good place in your life or a dark place? Do you feel it would help to shine the light on more positive areas, to slowly inject that positive to get you to a better place? If you do, you are not alone. We all go through this at one time or another. We all go through it in durations for the rest of our lives..it is a part of life. I hope you share this process with me. I would love to hear your insights, or even your setbacks. Please feel free to comment below. We can all learn something from one another. If you or anyone you know are in a dark place, I hope you don’t mind me telling you, take heart, it can and will get better. Rather than fear change, it can be a strange comfort. Whatever it is that holds us down, we can count on change to alleviate the burdens. Life is an ebb and a flow. Remember those two flowers in the corners of the room? I hope you can recall, when you need it most, to dim the light on the negative…that dead flower in the corner, and turn up the light on the live, bright one. I feel the more we shed light on the good, the positive, the more positive will fill us, and the better we can endure, and even overcome and succeed. We all know the “dead flowers,”…the negatives, will always be there. But to turn the light up on them does us no good. I just hope we can find and reach for the right dimmer when we really need it. And when you are in the dark spots, know my heart is right there with you. I understand what it feels like, but the comforts I can offer you are, you are not alone, and there is light, and you will get to it. Just give yourself time and patience, and never give up. And strive to never give up on making second nature, to turn up the dimmer, and shed light on the positive. We will get there, I just know it! So, it’s been 12 days since my last mewsing, and maybe you are starting to think I might be one of those blogs that gives things a try and then just gradually dwindles down. Perhaps eventually there just won’t be anymore posts. I sometimes wonder that too. I have found many blogs like that. But I refuse to let that happen. I started out with a mission on this blog, and I am not going to give up easily. You see, I have been feeling stuck lately, and I know where most of it comes from, and even big parts. I am also sick right now. As you can see from the items in the picture above, I think it might be some sort of flu. It has not hit me full blast yet, and I kind of hope it does not. I am attempting the ole’ vitamin C, some tea, echinacea, cough drops, and all that fun stuff. 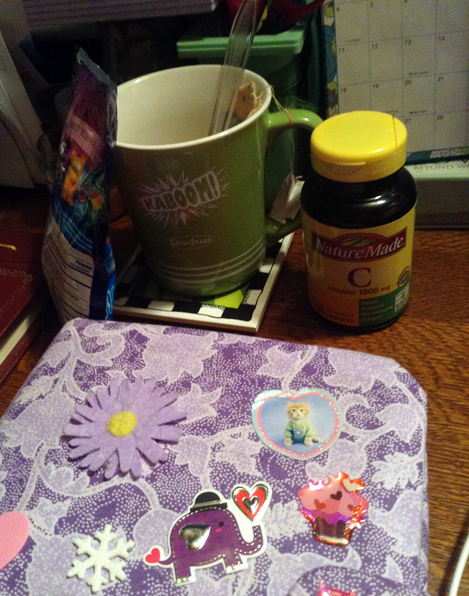 Sitting nearby my tea and vitamin C is my planner…which is largely dormant at the moment (I actually took the time to cover it with some Valentine’s stickers to try and motivate me), as I sluggishly search for inspiration. I know I am feeling discouraged. It is my wish to build up a small community of people that come here and interact with me. Not a lot of people, mind you. Just a small family-like atmosphere of people that have some things in common, can relate, and interact. I truly wish to create a place where people inspire one another, help one another, and connect on whatever might move them. But it does not seem to be happening. I know I just have not hit on the formula that really gets things started and going, and I am truly trying to do that. I know the key to blogs is having content that brings people in, has them interested, is important to them and has something to offer them, and keeps them coming back. I so much want to give that. But I am new to this medium. Only doing it for 3 months now, I am still getting to know how things work and what to do with it all. I am sure that growing process will take a long time. But the thing is, I can’t do it without you. This blog is a winding road right now, trying every direction the path has open to me. I see something akin to hundreds of roads there ahead of me, and I keep randomly picking one after the other. It is sort of aimless, like wandering without a map. But, you, the reader, can offer me a map. I want to steer in the direction that you wish me to, as long as I can do so. I want to give you things you want and need. But the key is, you have to tell me what those things are. In the long run, together we can take this in interesting paths. So, I will attempt now and then, in my posts to get you to offer me feedback, because I truly want to make this a place that we both enjoy together. So, I am wondering if perhaps I can add some things to help you relate to me more, so that one day I can get comments and feedback that can help me relate to you more. Would an about me section help? Are some of you wanting to offer feedback but shy to use comment sections? Is anything wrong with the blog that is making it hard for you to submit comments? If there is anything I can do to make this easier, I am very willing to do so, but it just takes a couple/few people to let me know. Would adding contact information help? I am a shy person, but very approachable, and if for some reason I am not to some, I wish to improve that. So, until I can get someone to offer me that feedback, I am just going to keep trying things until they work. This blog for now is about me, but I am trying to open myself up so that it can be about others too. I want to offer you, the reader, things that can help or add to your life. That is why I offer printable things, diy’s, and budget finds. I want to improve those things too. I want to expand on the things that interest me, so that I can have you join me in that dialogue, benefit from anything I know and can do, and also be inspired and derive from what you know and feel too. But enough on that, you get the point. So, along with the discouragement, I have been feeling stuck lately. It has to do with other things going on in my life too. I am at a precipice where so much has to be done, and I feel so insufficient to do it all. I have a whole house to organize, my health to improve, relationships to bridge and improve, and the huge ordeal of finding my way on this foggy and murky road toward career goals. In other words, I have a whole life to rebuild. Something inside me has been telling me this one clear message that I cannot escape, not that I want to. It says, do what you love, and the answers will come. It also tells me that if I keep blogging, I will find the answers. So, I keep plugging away at what I DO know how to do, writing out my thoughts, experimenting with the abilities I have, and hoping clearer roads will soon be ahead. If you are along this journey with me, I thank you from the bottom of my heart. I know I have a lot to learn, but I promise you my heart is in the right place. Wouldn’t it be great one day, if you could say you were there when I was just starting out, and then there when things start to happen, and then again there when I achieve the many points of success? Wouldn’t it be great, if along the way, I can also inspire you for better things in your life, bring you joy, and turn around and hopefully help your life too? It won’t happen overnight, but another one of my goals is to learn from and enjoy the ride too. So, until more things start happening, I did one of my usual Pinterest searches. Again, I like to see how others interpret terms that pop into my head. 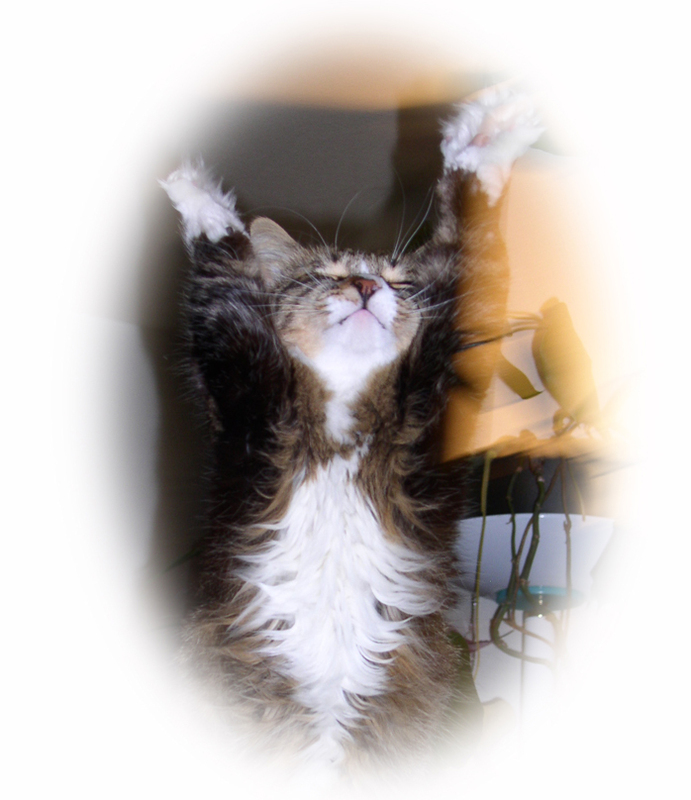 So, I searched for “feeling stuck.” It returned a lot of self-help articles and of course the quote images. I haven’t had a chance to look through them all, but that was the jist of things. Three things caught my eye most, and I will leave them with you, before I wrap this up. One is a particular quote, that really stood out. “Feeling stuck doesn’t mean you actually are. It just means you haven’t found the right path for you yet. Hang tight. You’ll find it.” I am not sure who the actual author is, but thegraciouspantry.com is the poster of this quote. It hit home for me. Again, something deep down just keeps telling me to plug away at this, keep trying, and the right avenues will open up. So, with just a few drops of faith, I continue on. Two is another quote that I liked. “If you’re going through hell, keep going,” by Winston Churchill, and it speaks for itself. Three, is an article I found, which I think holds a lot of truth, and is something I endeavor to follow. It is called, “11 Things to Remember When You Feel Stuck,” and it is here: http://www.powerofpositivity.com/11-things-remember-feel-stuck/ If you are feeling stuck in anything, I do recommend the article, as it has a lot of inspiring and helpful tips. I like that in particular, it’s first tip is to maintain focus. That is a theme which keeps entering this journey I am taking, so I am paying heed to this. I also like that the site name includes the idea of the power of positivity. It just rings well for me. So, I hope today/this week, you can find inspiration, especially if you need it as I do. I also hope you are hanging in there with me. I am not quite sure yet what my next step will be, but I intend to do all that I have indicated I would do in my previous posts. I will plug away at the articles I have said I would do, keep on going with what I know how to do, and keep reading and learning too. I might be slow at it, but I WILL get there. I hope you can be patient with me, and not give up on me. Even if I am sluggish, I *am* determined! Until I can figure out what I wish to do with an “about me” section, I am just going to link it to my very first post, which really gives a huge idea of who I am, and what I am about. I hope that helps for now. I found these four items some time in the last month or two. I could not go without sharing these with you! It is my last frugal find for today, a bonus for you. It is worth noting that many nice stationery supplies are to be found at Dollar Tree. I also recommend trying more than one or two different stores as they often will have some different stock depending on location, surrounding area, and size of store. They have had some nice calendars, memo pads, sticky notes, clips, flags, and the list goes on. 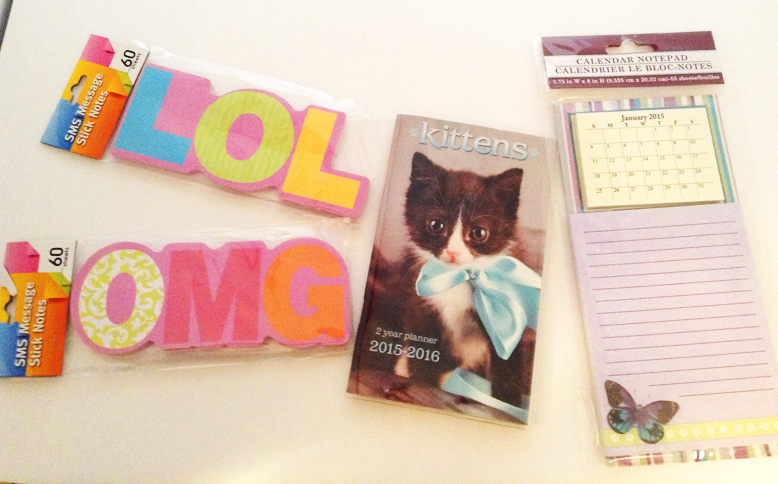 These four items, of course at one dollar each; are two sticky note pads with the LOL and OMG acronyms which I love, the TWO year calendar with kitties, and the calendar memo pad. The two year calendar planner actually, not only has two years in it, but each month has 2 to 3 kitty images, color background, differentiating color highlights, lines on every day for writing notes, holiday listings, before and after month mini calendar on each month, moon phase listings, a notes section on each month, a mini-contacts section/address section in the back, and a few notes pages in the back as well! That is a lot for one little pocket calendar for one dollar! It is perfect for a purse and quick on the go notes and appointment jotting. The memo pad is a really neat idea. It has the memo pad on the bottom of course, and the calendar pages pad up top. 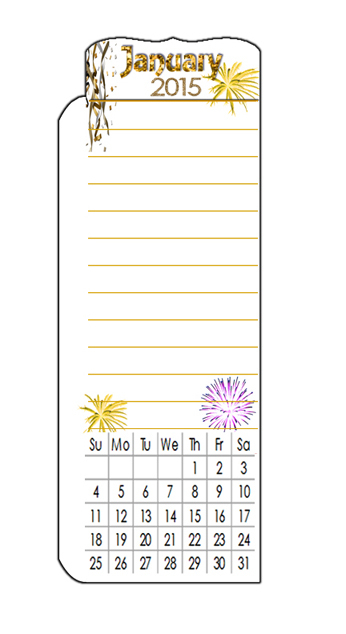 The mini pad has four sheets for each month. This makes them nice for putting in all your calendar need locations, like your wallet, your planner of nearly any size, a journaling spot, and even would probably fit nicely in a Project Life album slot. I also think it would do nicely for jotting a small tiny note and sticking up as a reminder for someone, say an appointment for your child or significant other…stuck to their door or computer or to the fridge. I am sure there are lot of ways these can be used. The back of the cardboard they are stuck to has no magnet, but I can see one could easily be put there for the fridge, etc. I love this combo pad, and think its a wonderful idea. You cannot beat the price too! 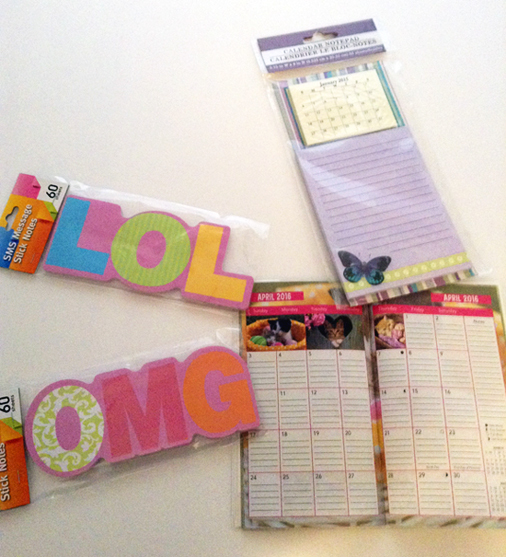 I love these dollar finds, and love all of the dollar store stationery and calendar items! I hope you find some goodies too! P.S. – I hope to have a few more budget finds posted for you this week, a dollar store diy, and possibly some journaling cards if I can find the time. I have lots to organize here, and quite a mess to tend to. Speaking of which, would any of you care to join me on my home organizing undertaking this year? I am open to sharing the process. But I must warn you, my home is in quite the mess. My goal is to get it to the point where we can host Christmas here next year, and for that it is a pretty large task for all this year. We are in the process of merging two households, loads of stuff, and several generations worth of things. Plus I have moved completely across country and come out of some rather large and difficult tragedies. So this very big job is the result of all of that. I am basically going to be setting both bigger and smaller goals, and it will take me most of the year, if not longer, coupled with all my blog goals, and then personal goals, and relationship goals. I might be up to lot of before and after pictures, and the ideas I come up with, along with links to valuable resources which also help me along the way. But, before I start yet another section, it will require at least a little feedback to know if there is any desire for this, and if it is worth the extra effort to do the work involved with documenting the ordeal. Let me know what you think. 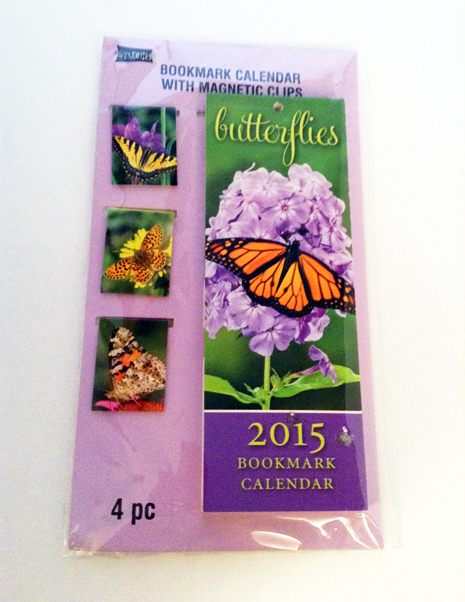 Bookmark Calendar/Magnets Deal – Less Than One Dollar! Okay, so this might not be a big deal to some, but for me, it was a really GREAT find! 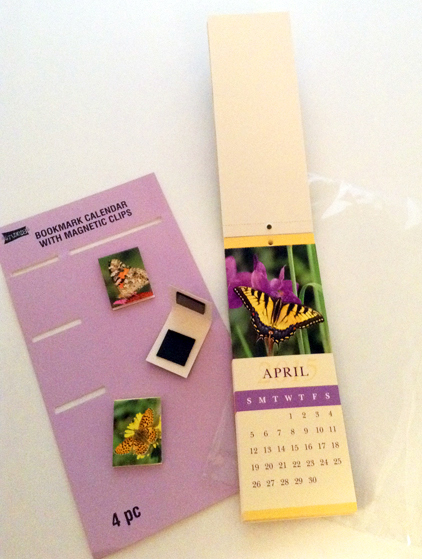 I found this 4 piece bookmark calendar/magnets set for just 45 cents! This was at Michael’s in the bargain/dollar section. The monthly bookmark pad is about 6 inches in height and a little over 2 inches in width. Each page/bookmark in the pad is serrated so it is easy to tear them out. They are thick, decent quality, like that of a greeting card thickness, and better than printer cardstock. Each page also has a different butterfly on flowers scene. The colors on each seem to go well with the corresponding season. 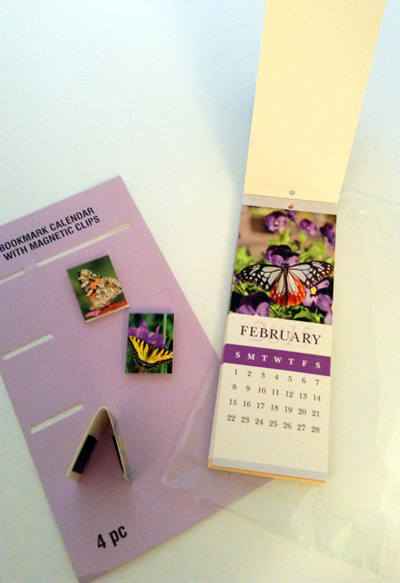 The magnetic bookmark clips are approximately 1 inch by 1 and a quarter inch. 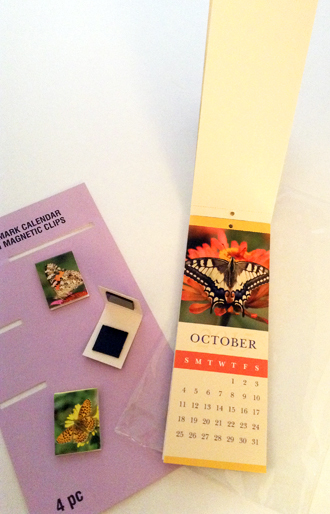 They are of the same quality and thickness of the calendar bookmarks. There are three of them, and the magnets are decent quality. I was able to put them on a bunch of pages, at least 5-10 or so and they held on well. I SO love the images, and of course butterflies are one of my favorite creatures after kitties. For 45 cents you cannot beat this, not even at the dollar store! I think the sale price brought it down from just a dollar or two, but I am not positive of this. I can only tell you that my receipt says 45 cents. Michael’s has such great deals and stationery items in their dollar section, so I recommend checking it out! Especially check before and after holidays for special finds like this one. I look forward to using these in both my planner and journals. I am loving these! After-Christmas Clearance Find! Crafty Centerpiece 70% Off! I always love all the made-up arrangements and crafts that Michael’s has. They often inspire ideas, let me know what’s popular, and just are plain fun to ogle at! You can buy what they make, already made, or buy the materials and do it yourself…I love that option. I often will pop in there to pick up an occasional craft/etc. supply, or just to browse the dollar section. I cannot afford too much, so it is fun to browse an area I can actually fit into my small budget. Well the past week or two has been particularly fun. I have a few bargain finds to share with you, but I will start with this one, a 70% off clearance item from Christmas! Now, as you can see, the original price tag says 49.99, but for this clearance sale it was jut 14.99. Fifty would be way too much, in my opinion, and I can make it for way cheaper, but the 70% off sale brought it down to fifteen dollars. In most places that is likely what you would pay for the beautiful sled it comes in. I don’t think I could make it cheaper than that. The whole thing stands at close to a foot tall, with the sled measuring in at about 8 inches tall. 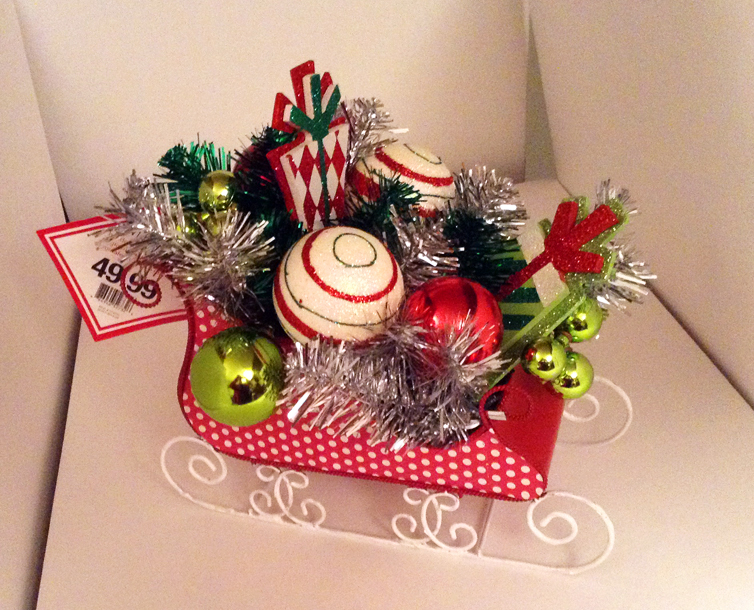 I love this deal and I think this sled will be my table centerpiece next year. I love it! All of the Christmas centerpieces and made crafts were at 70% off, and it was hard to choose. This was about a week ago, so I am not sure if they will have anything left, but keep in mind to go there right after a holiday and I am betting they clear out all that they made at a nice sale price. Check back there right after Valentine’s and I am sure you will find a nice deal…I know I will be peeking in to see myself! Yay, I finally have another Page Marker/Bookmark ready for you! It is for the month of January. Yes, it is a week late for the start of the month, but for one, you all know how the holidays can be, and two, I only got home in December, so catching up around here has proved challenging, but I am well on my way to getting to where I would like to be, and being somewhat caught up. It is my goal this month, to not only achieve some of what I have set out to do, the resolutions, and to have more timely content, but to make sure that February’s page marker/bookmark is not only on time, but hopefully early! 😉 I hope you bear with me. As usual with anything I offer here, this is for your personal use only. You are welcome to share this with people you know, especially on social media, as long as there is a link back to this site, and do not direct link to the image please. Link to this page where they can then download. I hope you enjoy using this. It is great for putting into planners and journals, or even Project Life layouts. This time I actually got to test out printing it, and it was pretty successful on the size. I made it so that at 100% it would fit a 5.5 by 8.5 planner as a full-page page marker/bookmark with a tab that sticks out at the top. I wanted it slightly smaller for mine, so I sized it down to 90% and I am liking how it fit. You can size it accordingly, if you have something smaller or wish it to be smaller. I recommend testing it by setting your printer to draft mode (this will save on ink while you test) and using regular paper. Then once you find a size you like, using regular color print, and using cardstock. You can even laminate it for further sturdiness and even to dry-erase write on, though since it is only really usable in this month, this year, I prefer writing right on the cardstock. But dry erase is good if your schedule changes or if you like to change around your notes, etc. I am still working on how I am doing the layout of this printable item, but would also like/welcome feedback on what you would like to see on it. Do you like the size? Do you think the resolution should be higher, calendar smaller/bigger, more/smaller list lines, a bigger side tab for the holes, etc.? I can only make it to others liking if they let me know what they do and don’t like. =) When I find something that really works well, I will keep the size consistent each month so that you always know what size to print them out at. I am even considering making a perpetual Page Marker/Bookmark, but I am not sure what people would prefer. I love having the monthly and the calender geared toward each month, with holiday themes, but that is something I am flexible on, or may keep in addition to a perpetual. Let me know what you like, and what else you would like to see. Enjoy, and once again, Happy New Year! May this year be your best and most successful yet! The large size version for Download Here. 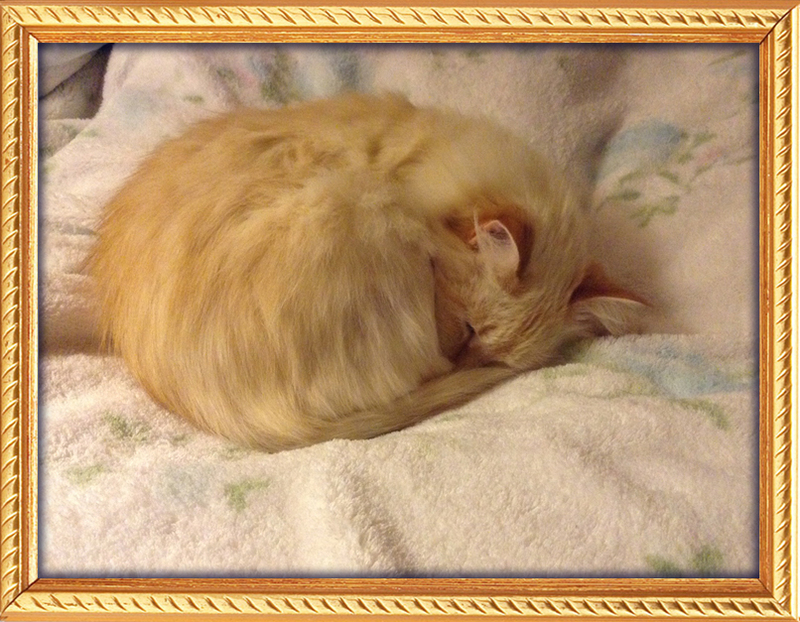 …And an introduction to my golden kitty, Honey. She is a gentle, delicate cat, and a very loud purring one. Okay, well maybe not new me, but hoping for the improved me. Lots of changes to make this year, and I hope to make most of them, if not all. For me, the best way to start will be setting long term goals, then short term ones within each long term goal. I want to make this a truly golden year. To start, I am throwing up a new theme. I hope it is done even better than the last. As I keep creating new things, and designing new layouts, I hope my skills have been improving. I hope you all like it. Earlier, I came upon my Honey-kitty, sleeping peacefully, and found myself likewise feeling more at peace today. I know despite whatever hardships come my way, I can get through them and believe this will be a good year. Golden seems fitting here. 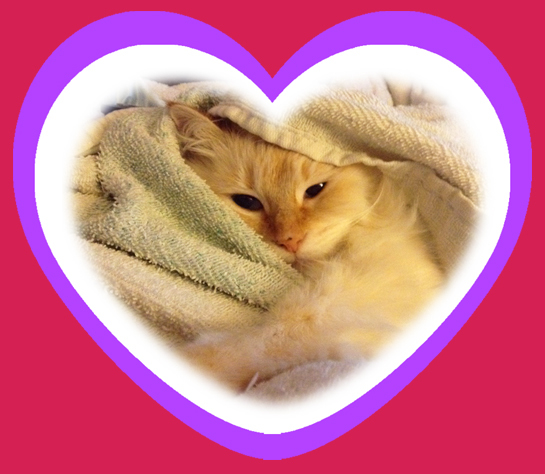 It is the color of my sweet Red Point Birman (the mal-nourished, sickly stray that came to me about 2 years ago) pictured above. It is the color of beautiful sunsets. It is the color of softly swaying wheat. It is the color of success, power, strength, achievement and triumph. These are the things that I intend to strive toward. It is the color of this year for me. I know for some, golden symbolizes gold and/or money. And I do believe that success can lead to money, but for me, money is just a bi-product. I have learned through long and hard ways, while severe lack of money can hinder…an abundance or over-abundance of money can also be a burden. So, I do not truly consider money and/or gold to be the highest representation of the color gold. I have even heard that the commodity of gold is not a wise investment. Gold for me, is prosperity in other ways. It is wisdom and experience and strength in it’s seasoned form. Hence the term, “Golden Years,” or “Golden Anniversary.” I feel this will be a golden time for me. I wish to come up with a posting schedule. It is my hope still to get feedback as well. It would help to know which article-types and content appeals to people the most, and what is my strongest suit. But for now, until I do get any feedback, I will do what comes to me, what I enjoy doing, and what I feel compelled to do. I am thinking perhaps doing 3-4 articles a week, give or take, might be a good start. Perhaps a mewsing on one day of the week, a printable item for people to download on another day, a bargain find another day, a gratitude post (until I possibly work up toward daily), and a DIY once or twice a month, working up to weekly. Again, I would love to hear what people think of that, but for now, I will do what I am able or up to doing, and also what comes to me. And now, here comes the exciting news…. What is the great experiment, you might ask? It is me. It is a challenge for me, and for you. How will this experiment be performed, what will be the tools and variables? The how is, career related, the tools will be me and you. The variables will be the various skills or talents I have, and which ones will best lead me in the right career direction. So here is the idea…I have been relocated, and had a couple disabilities weighing me down. I have been out of work awhile now. Some of the time has been just down time and recovery from too many tragedies and spills to name. Some has been this big move across country and getting through the stuff I have had burdening me. I still have more to get through, but I figure I can do that as I find my way down the career path that will lead me toward being a more productive and successful person. It is time now to move forward, and find my wings. And I am hoping, you, the reader, will help me find my way. It is going to take input from others, so I truly hope I can get my blog more interactive. So, I am sure you’re wondering, what is this all going to look like, what does it mean in terms of the blog and this section? It means I am going to present the abilities I have, some which you have already seen, whether very novice, or more experienced in them, to you the reader, and to others, and get feedback on which I should be pursuing in terms of career/job possibility. I want to and need to work again. The challenge here, is to allow the signs along the way…the road posts, the input from you, from others in my life, and whatever other things “speak to me,” to help gently direct and guide me down the twists and turns and paths that will eventually lead to my career choice. I have, for some time, felt at a loss for ideas on how to get back on my feet and be working again. I have also felt mostly lost on which direction I want to go. Sometimes it can be hard to see your own self objectively. So this idea hit me, why not be interactive on my blog in finding out where others see me going, which direction they think I would be most suited for. If it is internet or computer related especially, or perhaps even not, it is then when I will launch the business end of my website. Right now, the business end, katfancies.com is empty and sitting idle. At one time, it was going to be either a web design site, a graphic design site, or a multimedia design site…or perhaps all of the above. Now, I am not so sure if I do want to do web design, my abilities are very outdated in that area, and I am liking doing the graphic design even more. I also love writing and crafting, and many other things. But it could end up being anything! It could be selling something I invent for all I know! =) What it WILL be can be partially determined by you! This personal blog is all about my growth as a person, and the journey it takes me on. But I hope some day to be able to open up the business end, and what it ends up being, could have a lot to do with you, the reader! How would YOU the reader, like to know you helped shape the life and career path of someone you just read about on the net…on a blog? Wouldn’t it be great if we could all do that for each other? I really would love to know what others see as my greater aptitudes. I would love to know what you think I should be doing. Of course what I enjoy doing, and what gets greater positive response will contribute, and the feedback of my friends, family, and loved ones will make an impact too. But I am giving you the chance to make a difference in a life that has been down and out, and sincerely reaching for something better and more meaningful in their life…me! In my journey of recovering from so many life hurdles, I am at a point now where I feel it is time to firmly plant my feet on the ground, stand up, make a difference, and gain more of the independence that every life needs to feel whole. As I learn to manage my time better, and get stronger, I also wish to find an outlet for my desire to volunteer my time for those in need. A big part of me has had a desire to go and volunteer some time to talk with, play with, and spend time with children with cancer, and I am not sure why. Just the thought of making them laugh and smile and adding to their lives has long appealed to me. But I will save that for later. For the time being, I need to “put my own mask on,” before I am better able to help others “put theirs on.” But I am hoping to get feedback on that aspect at a later time as well. For now, I am going to figure out ways that I can preset my abilities and aptitudes to you, the reader, in fun and interesting ways, and hope we can open up that interaction that guides me to the destination I am meant to be in. I am on a fixed income right now, which has something to do with those disabilities I mentioned. But, I want more for my life. I want to stand on my own, be productive, contribute my fair share to this society, and be able to get to a better place. Will you help me as I find my way? Perhaps I can figure out how to add polls to my blog, use samples of my work with polls, do a task diary, make sub-sections with each possible career path, perhaps make a special image map that acts as an actual map of the directions I take, or special widgets to make this experiment more fun. What do you think would make this more fun for you, for us? What would you like to see me add? What do you think of these ideas, what ideas can you add, or what do you think of the idea as a whole? How would you envision this cooperative to work? I really do welcome input and want to make this a team effort. The possibility even strikes me, that one day, if this experiment works for me, that I can use it to help someone else do the same! Wouldn’t that be awesome?! So, please join me, on my “Great Experiment!” The experiment that challenges me to find the work I am best fit and meant to do, and that has others help me shape that future. My heart and gut tell me that this is the way to go, that this will help to guide my direction. I look forward to the roads that it all takes me on, and truly hope you will join me on this fun and long journey! It really is a golden day, and a golden year, and I anticipate lots of fun and interesting things, as well as challenging, to come my way. So, I will wrap this up before 1/1/15 is over, just thirty minutes away. But I am looking forward to where this road will take me, and hope to see/hear you along the way too! The mean reds…or maybe I should call it magenta. Either way, it revolves around my point. You see, the screen-cap I took above is from one of my favorite movies ever, Breakfast at Tiffany’s. 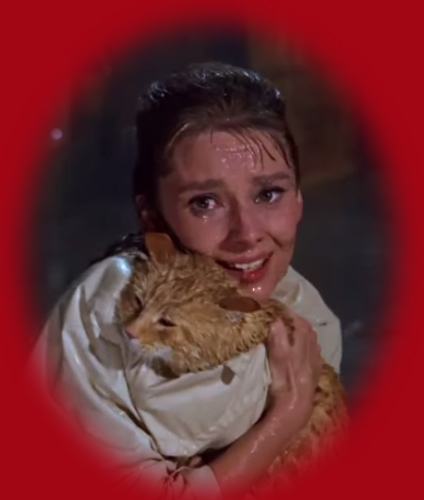 In this scene, she is undergoing a change of heart, and saving/retrieving her kitty from the rain. She has realized here that to truly be free, you have to belong, to each other, to someone, to love. But the reason I mentioned “the mean reds,” was because it was a line she used in the movie. She basically asked to her male friend, “ever have the mean reds?” He had asked if it was like the blues, and she said no, referring to the fact that the blues are more like depression or sadness. She goes on to say the mean reds are being suddenly so very afraid of something, but you do not know what. I guess I could say I feel like that on some levels, but mine today are more basic than that. I feel very irritable today, and angry, but like her emotion, I am not sure at what. When I think of anger or aggression, I think of the color red. So, in the spirit of one of my favorites I am calling it the mean reds, since anger can be mean. But if you are a stickler for exact match meanings, just call it the mean magentas. I am not sure why I am feeling this way, but I know I don’t like it. So what better to work through it, then spatter my thoughts out on my blog. I don’t like anger or aggression or negativity, but hey I am human, and I feel those things time to time, like anyone else. You know those days when everything sparks irritability? When little things make you see red? A package won’t open right, so you tear at it like the Hulk. A door gets stuck, so you slam it. You know, right? Okay, so maybe it revolves around that ole female stuff…that is possible. But I wonder if it revolves around things that are stuck deep down. After all, I am a believer that anger isn’t a true emotion, per say…to me, it is a symptom of other things, a mask for pain, so to speak. Perhaps there are things I am not facing. I know I am worried about all the problems and issues I have to face. I know I am worried about my health, about money, about my career future, the disorder of my home, family, those who have passed both recent and old, and a whole slew of other things. What else is new right? We all worry about these things. Many of them often at the same time. I am feeling extremely overwhelmed. I know there is so much I wish to change and make better. Sometimes, like now, it is so much, that it feels impossible or overwhelming. But, I know it is not impossible. So, okay, I can sit here and feel cranky and angry, and perhaps let it out, making sure its only on a couple unimportant inanimate objects like a piece of paper or unwieldy package, but then, it is my job to find a way to transcend. So what do you do when you feel this way? How do you overcome and move on? I really hope someday I get to hear actual feedback from a reader, or even hoping readerS. That would make my day. But for now, I have to ask myself this question. I have to find ways to overcome and get through it. So, the idea machine in my head begins to roll. The way to knock out darkness is turn on the light. The way to chase away negative, is surround in positive. So, I think of things that I think might chase away these mean reds. 7) Work on my diet, and eat things that can balance me chemically, and make my body happy. 6) Get out and walk and use physical movement to work out the negative feelings. 5) Find a way to give or volunteer or do something for others. 3) Work on doing things that make me feel like I have accomplished something, or even successful. 2) Surround myself with words and images and things that inject positive into my mind and heart. 1) And number one, surround myself with elements of love, like people/family, those who uplift me and share closeness with. Also, to work on relationships and making them closer and stronger and healthier. So, since they were the first things that came out of my mind, my gut, it tells me those are the things I must work on this year, let alone always. Just a little while ago, yes late at night too, I made myself a high protein dinner with eggs, and lower fat sausage, and spinach in the eggs, and some milk. I am concerned about some health symptoms lately, that have to do with female stuff, and the blood issues I had in the past. A few years back, I had a bout of anemia and got a clot in my lungs. I got very lucky and could have died. One clot to a different part of my lungs or brain, and that would be it. The clot came as a result of my blood not being healthy and having anemia. It was during a time when I stopped caring about myself, and took poor care, and basically gave up. Well, the past few months during that big project, I was eating and sleeping very poorly just to get it done. I think my body is telling me it is not happy. I have to be watchful of getting enough iron in my diet or the anemia could return. I was lucky enough to beat it and get better, but I still have to be careful. I do not want to end up the rest of my life on anti-coagulants. Well, lately, some symptoms have told me that I think my blood is not happy with me. So, hence the high dose of spinach I put into my eggs. It is time to fix that, before it fixes me. I want to fix my health most of all, because everything else I do will depend on it. The people who love me also depend on me staying healthy. I know what it is like to care for a sick loved one, as I took care of my mother ill with MD for the better part of 17 years before she passed. I am determined not to leave those I love with that burden. Not that my mother was the burden, per say, but watching her suffer so badly was. Her disease was the burden, and I wish she had taken better care of herself so that she did not have to suffer, and so that she would still be here today. I am convinced one of my missions in this world, is to overcome the illness and suffering of the family that has come before me. I feel like the signposts are pointing me in that direction. They told me 20 years ago to give up smoking, and I did. They told me to never let alcohol get to me like it did my father, and I did so (not let it get to me.) They tell me to take care of my health, or I could end up in a bad place as well. Heart issues run in my family, as does cancer. I was even born with a hole in my heart that did close up. But, still, these are all warning signs to me, to take care, and get to a better place, while I have the chance. I have so much to do, and while I have my beloved in my life, and my kitties, I feel weighed down and sluggish, wishing I could find more support and encouragement. I know he largely looks to me to encourage and nudge, and I am such the nurturer. But right now, I feel like I need this so much. So…where to start. That is the question. Something funny happened today. But before I say, let me backtrack to an understanding of why it was interesting and weird. Years ago, I had heard about a doctor named Masaru Emoto. He is an author among other things, who has done studies with water. You might have heard of him. Some of his story was featured in the movie, “What the Bleep Do We Know?” I had heard/read that he conducted studies of water molecules and froze them and studied how they react to environmental stimuli. Supposedly, they remained structured and beautiful when injected with positive. They became beautiful looking snowflake-like under the microscope, and conversely, broken and mottled when given negative stimuli. I had also heard about prayers being conducted over polluted waters and the actual pollution being cleaned away by this action, by what I heard was dozens or hundreds of people, or something like that. I have always found the subject fascinating. Then today, I sat down to write my blog, and found one of my magazine subscriptions came in today, and when I flipped it open real quick to see what it had in this issue, it went right to an article on this man and his research. It also mentions a semi-new book he wrote back in 2011. I think I might pick it up in my travels, it’s called, “The Miracle of Water.” (If I do, I will let you know.) I like that title since water has so much of a role in our lives. It is on most of the earth, our bodies are made up of mostly it, we are constantly told to drink more water, and even many religious ceremony is celebrated or done with it. An even bigger wow, when I looked him up just a few minutes ago, I came to find he passed away just eight days apart from my father this past October. It just felt like this happenstance was trying to tell me something. Whether you believe in what Dr. Emoto claims or not, whether you believe in the experiments or prayer sessions conducted, there is no doubting that positive begets positive and negative begets negative. It is the basis for laws of attraction. So, once again, something around me, and something within me, tells me that I just need to keep surrounding myself with positive images and thoughts and ideas. I have to keep faking it until I make it. Mind you, it already has started to work. The more positive I seek and practice, the more I actually feel positive, so I know it works for me, even despite suffering from depression and anxiety. I like how at the end of the article about Dr. Emoto, it says he suggests that you place the images of positive crystals where you can see them to help encourage the positive in yourself. So, on that note, I think I will either cut out the ones in this article, or print from online, and place where I can see them. Along with other positive things I print out or practice, I am hoping this will add to the positive stimuli to inspire me. The article is in the January 2015, For Women First magazine by the way, in case you are interested. So, my goals now, the short term, are to develop other plans and goals centered around the ideas I listed above. I want to come up with a plan for the new year, to bring me closer to better health and self-improvement. Yes, those cliche resolutions. But I do truly want to make and keep some of them. So, it is now December 30th, the day before New Year’s Eve. I believe I am ready to face the new year. It will be tough, as I have a lot to overcome, but as I arch my back a bit, take a deep breathe, and find some inner resolve…I know I CAN do this. I might not BE something special or different or unique, but even if I am not, I will DO something special, I will give something special…somewhere. I am going to develop a personal program of improvement that works on all those above thing. My health, my home, my money, my career, and my relationships. I might not succeed at all of them at once or even right away. But the idea is not getting it all done, but to always work on making them all better, as I am able to. The idea is to never give up, even if I have setbacks. And if there is one thing I have demonstrated the ability to retain, its endurance. I will endure! I hope you continue to share this with me, whomever you are, if you are still there. I really do wish for most… that eventually someone will give me real feedback and perhaps encouragement and inspiration. All I have gotten so far, sadly, is about a dozen comments of spam. =( But, I will keep that light on and keep hoping. I really do feel this is a journey that should be shared. Something deep down keeps prompting me and telling me so. It is a new year, and I am going to find ways to make a new me…or rather just an improved version…or even just bringing light to, and to the bring to the forefront, all the things that perhaps I have really had all along. I hope you continue to share with me. If I do not get the opportunity to post again, which I am hoping to before New Year’s Day, I want to wish all of you a fun and safe New Year’s celebration,and above all, a Happy, Healthy, and Fruitful New Year. Milo and I both wish you a peaceful and wonderful New Year! Keep reaching and striving!